Before computers and software-based music production came along, everyone had to make do with hardware-based solutions. The multitrack recorder has been around in one form or another since the 1950s and it’s popularity isn’t going anywhere anytime soon. One of the key things that makes a digital multitrack recorder so appealing to musicians is that you’ll be mixing and recording mostly by what you can hear – rather than by visual representations of sound waves. This can be daunting, but it’s also the most likely to produce the best sound since you can’t just make something that looks good – it has to sound good. On top of that, chances are that unless you’ve got a powerful computer with a high-end soundcard designed for recording and producing music, your computer simply won’t be up to the task of producing professional sounding music. What is a Digital Multitrack Recorder? Multitracking is the ability to record multiple tracks at different times, then play them back together as a whole. These devices are an all-in-one recorder, mixer and storage space, and are incredibly handy for on the road, impromptu recording sessions. These machines allow you to play back what you’ve recorded, delete, save and add on to your creations. Many also include effects, drum machines, samplers and more. The main benefit of using a digital recorder as opposed to combining hardware and software is the portability. They can be moved around with absolutely zero hassle, and half the time you won’t even need to unplug them as they can be battery powered. They can be taken camping, to hotels or to songwriting sessions with your bandmates. There’s also the aural dependency. As mentioned before, the lack of visual representation of sound waves is preferable to many engineers, who are hunting for the best sound but can sometimes get influenced by how that sound looks on the screen. Finally, there’s the cost. A decent multitrack will set you back a lot, lot less than a decent Mac or PC that can handle the demanding task of recording music will. When you’re shopping for a multitrack, you’ll often see numbers 4, 8, 16 or 24 in the title. What these numbers refer to is how many tracks can be simultaneously played back. Different devices also have varying numbers in terms of how many tracks can be recorded together. If you’re considering recording several instruments at once, you’ll be best looking for a 16 or 24 track recorder as many of these will record 8 together. If you buy an 8 track recorder, it may only record 2 or 4 simultaneously. A part of any decent recording set up is effects. If you truly want a device that’s all-in-one everything you need, make sure you pick one that has some built-in. If you already have some decent effects units, you can look for a loop/send option on your recorder, which will allow you to include some effects in the recording. If you’re planning on just getting down the basics on your multi-track, to get rough ideas down, effects won’t necessarily be a requirement. Some multi-track recorders include ‘virtual track’ features. This is excellent if you’re looking to ‘mix down’ several tracks into one. Virtual tracking allows you to record over a part several times, without erasing the previous recording. This can enable advanced editing, which will suit those who are keen on music technology. Virtual tracking also means that everything is recoverable, a bit like pressing ‘undo’ on your computer. Most multi-tracks have USB or micro-card export functions. Some export only as an audio track, whilst some can export as works in progress, which can then be mixed in sequencing software. If you would like the option of exporting an editable project, look for a multi-track that’s designed to be used in combination with computer software. Some of these machines have extra features that might make your life a lot easier. Some have multi-tracks with drum machines built in, and some even allow you to make samples as you would with an MPC. Some include backing tracks to jam along to, so you can record yourself improvising. If you’re using the device for songwriting or getting ideas together, these extra features can be the difference between being inspired or remaining ‘stuck’. 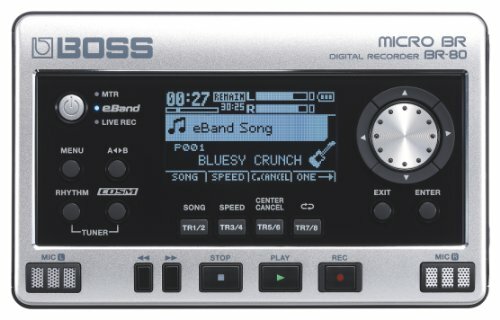 The Boss Micro BR-80 is a small, portable 8 track recorder which won’t make too big of a dent in your bank account. It has the easy-to-navigate stop, play and record buttons as well as a wheel to take you through your saved songs and to navigate through different features. 2 tracks can be recorded simultaneously, and 8 can be played back. For every 8 that are played back, 8 more can be stored within one track via virtual tracking. The Micro BR-80 also has built-in effects suited to guitar, bass and vocals. There are backing tracks and rhythm backings included, too, so you can jam with this little machine. It comes with editing software that you can use with the device connected via USB and this machine also works as a USB audio interface. To power it, you’ll need either 4 AA batteries or to use the included DC adapter. The Micro BR-80 will suit songwriters who like to record their ideas as they become inspired. It will be less suited to those who are looking to create a more professional end product, as its small size makes advanced recording difficult to achieve and there are only 8 tracks. It’s very small and can be powered off 2 AA batteries. There are virtual tracks included, so you can rerecord parts without writing over previous takes. There are built-in effects, backing tracks and rhythm patterns. Extremely compact package with a large number of effects and works as an audio interface as well. Great for guitarists thanks to the effects and cabinet emulation. You’re limited to 8 tracks. The small screen and multifunctional knobs can take some getting used to. Only has one guitar/mic and one line level input. Doesn’t work as a DAW controller. The Boss BR-800 is a bigger version of the BR-80. This one can record 4 tracks simultaneously, and playback 8. This makes it more suited to bands or duos looking to record a demo. There are small faders which make it easy to control, and play, record, stop, fast-forward, rewind and more navigational buttons. There’s a loop out, so you can introduce external effects and there’s also an onboard effects processor with high-quality vocal and instrumental effects. Like the BR-80, it also functions as an audio interface and can be connected to software via a USB. The USB also provides bus power, saving you from using the 6 AA batteries required to power it on the go. There’s a built-in drum machine and the software includes loops and backing tracks. The BR-800 will be well suited to those who play in a group and want to record a demo together at the same time. It will also suit solo artists who want to get creative with drum machines and loops. This will be less suited to those looking for something to record drums on, or to people looking for a permanent set up. Can record 4 tracks simultaneously, and playback 8. Functions as a USB audio interface. Includes sequencing software with loops and backing tracks included. Getting used to all of the knobs and buttons can take some time. The Zoom R8 is an 8 track recorder that can record 2 simultaneously. It has faders for each of the tracks, as well as a master fader, making it easy to mix what you’ve captured. The R8 doubles up as an audio interface, although it doesn’t have bus power. It can be powered off 4 AA batteries or via the included AC adapter. There’s a built-in drum machine, making it easy to get creative and there are also several effects included in the hardware, enabling a professional sounding outcome. The drum machine part is easy to use with intuitive, light-up buttons and the knobs on this device are easier to navigate through than on some other small recording devices. It does cost a little more, though. The Zoom R8 will suit songwriters who want to get their ideas down either for reference or to export for sharing with others. The drum machine and built-in effects add to the creative options and the faders make it easy to use. It won’t be suited to musicians looking for something that can record more than 2 sounds at once. Can record 2 tracks simultaneously and playback 8. Power requires only 4 AA batteries or USB bus. There’s a mixer, drum machine and sampler included. Can be used as a DAW controller and 2-channel USB audio interface. Comes with over 100 effects including amp modeling. Has a built in condenser mic. You can only record 2 tracks at once. There’s no sequencing software included. The microphone is good – but not as good as a high quality external mic. The amp modeling is okay at best. The actual usage is quite tricky and slow going due to the old user interface design. The Zoom R16 is step up from the R8. It can record 8 tracks simultaneously and will playback 16. When used as an audio interface, it can input 8 and output them as 2. This device has a ‘Mackie emulation’ mode, making it great to use with Cubase or Logic, and it even comes with a download code for Cubase LE8. There are built-in effects for vocals, guitars and bass included, as well as a large collection of amp simulators. This large recorder is easy to control with a fader for each track as well as a master fader, and there are also LEDs to show the amount of signal that’s coming through each channel. Although it works great with computer software, this cannot be bus powered. You’ll need either 6 AA batteries or to use the AC adapter included. The Zoom R16 will suit musicians who are already familiar with recording and recording hardware/software and want something portable to use as they travel. 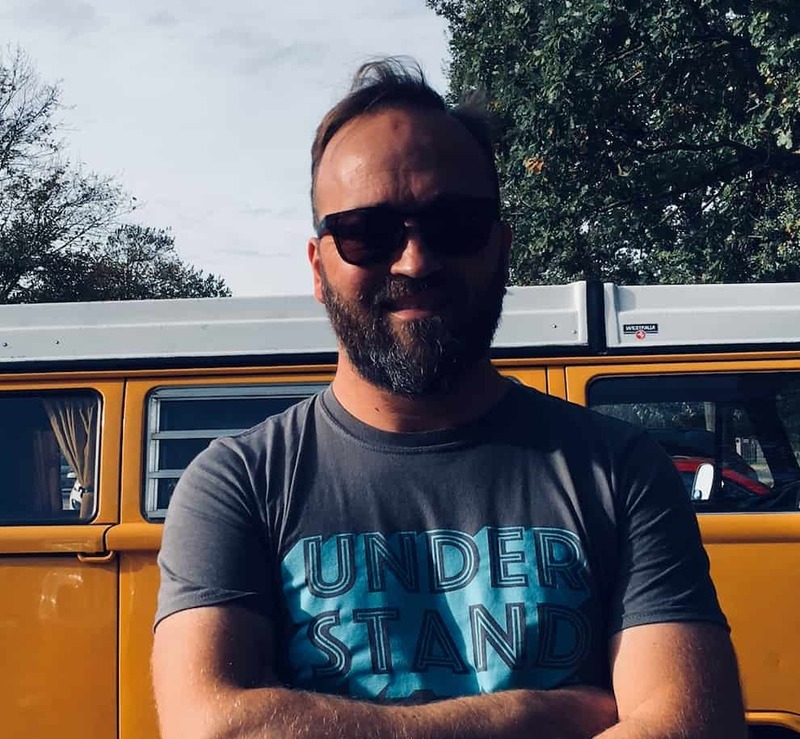 It will be less suited to songwriters who are looking for something to simply record basic demos on. Can record 8 tracks simultaneously and playback 16. The large size, with faders, makes it easy and intuitive to control. Mackie emulation mode makes it easily compatible with Cubase and Logic. The Zoom R24 is similar to the R16. As the name suggests, 24 tracks are able to be played back, rather than 16, giving it the potential to hold some much fuller sounds. 16 tracks are also able to be recorded simultaneously. This makes it a real option for bands with full drum kits. Most of the other features are identical to the R16. There’s a drum machine included, as well as an array of built-in effects including modelling amps. There are independent pan, level and EQ controls for each of the tracks, as well as faders to control the volume and a separate master fader. The Zoom R24 also has the Mackie emulation that makes it well suited to professional sequencing software, and it comes with a download of Cubase LE. The R24 will suit musicians who already know their way around a mixer, and are keen to work in combination with software such as Cubase or Logic. Although it can be used without a computer, it’s designed as a part of a package. It might not be the right product for those looking for something petite and portable, to record their rough demos or songwriting ideas onto. Includes Steinberg Cubase LE software. Records 16 tracks simultaneously and plays back 24. Includes a drum machine and amp modelling effects. There’s no bus power option. Battery life is limited to 4.5 hours. 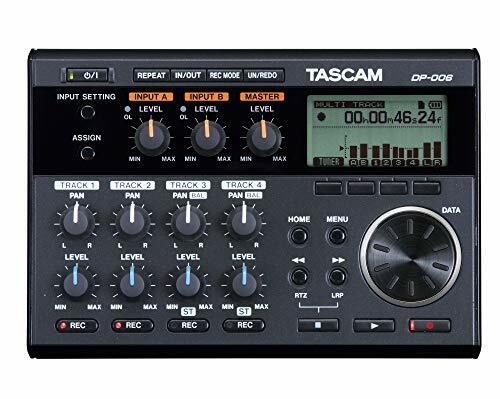 The Tascam DP-006 is a very budget-friendly option to record songwriting ideas or demos onto. It’s the only 6-track recorder on this list. 2 of these tracks can b recorded simultaneously. The DP-006 is very robust and compact. It has multiple knobs and a wheel which guides you through saving ideas, opening new tracks and setting up projects. It’s very basic, although it can be a little tricky to get your head around. Once you do, it’s a brilliant little tool for songwriting on. There are level controls for each input and track as well as a master level. The play, record and stop knobs are easy to use and the built-in microphones are of reasonable quality. The DP-006 will be suited to songwriters who want to record one or two tracks at a time, to record their ideas in a way that sounds of decent quality. It won’t be suited to those who are looking for something that works more like a mixer, or to people looking for built-in effects. Small and robust; you can throw it in your backpack without worrying. Two tracks can be simultaneously recorded, six played back. You’re very limited in terms of tracks. It’s designed more like a ‘sketchpad’ than a professional recorder. There are no options for effects. The DP-008X takes things a bit further than the 006. As the name suggests, it can playback 8 tracks simultaneously. Still, just two can be recorded at the same time, but it gives you more creative options if you’re a songwriter looking to add layers to a piece of your music. The DP-008X also works well as an audio interface, but still needs to be powered via batteries or an adaptor. There’s a built-in tuner and metronome and the condenser microphones are of surprisingly high quality. Each of the tracks has panning, level and reverb controls, giving it the edge on the 06 which lacks the reverb. The Tascam DP-008X will suit songwriters who are looking for a portable device with which to record quality-sounding demos, to submit to labels or to share with others. It will be less suited to musicians looking for something that works like a full-on studio, due to its limitations in terms of effects and simultaneous recording. Includes a tuner and a metronome. Up to 8 tracks can be played back simultaneously. Works as a USB audio interface also. Using it can take some getting used to, due to the small screen and multiple buttons. 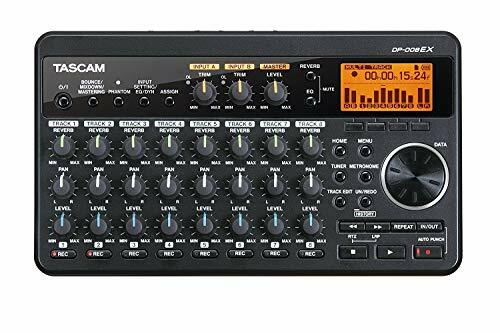 The Tascam DP-24D is a 24 track recorder that works just like a traditional mixing desk and software combined. It’s big, bulky and substantial, making it a serious buy for any musician, with a price tag to match. The design itself is intuitive, with faders, LED buttons, wheels and knobs. There’s a small screen to help you to navigate your activity and there’s a USB output for when you’re ready to export. The DP-24SD has a lot of built-in effects and can record 8 tracks at once. Its ability to record 8 together make it suitable to record a drum kit before other instruments, in the way a band traditionally records. The DP-24SD will be well suited to bands who want to make a full recording to studio quality. It will be less suited to those looking for something cheap, small and portable. Large, familiar and intuitive design. 8 tracks can be simultaneously recorded, and 24 played back. Built-in effects including reverb and delay. Many people would find it less easy to use than computer software. As you can see, there are different devices to suit different needs. If you’re looking for something simple, for songwriting purposes, the Boss Micro BR-80, Zoom R8 or the Tascam DP-006 will fit your requirements. 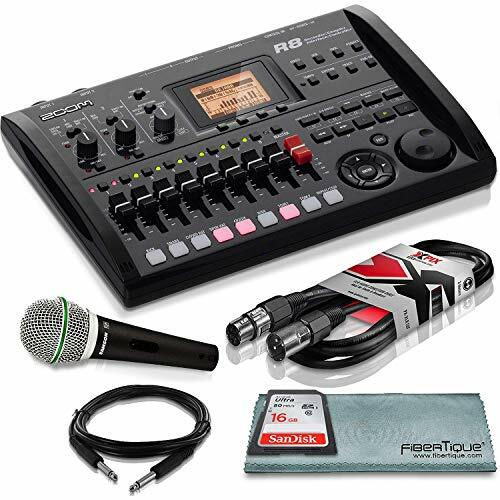 The BR-80 also has loops and backing tracks built in, which might aid some people’s creativity, the Zoom R8 has faders for ease of use and the Tascam model does boast the best budget-friendly option. There’s a Tascam DP-008X which takes things a little further than the 006, including reverb as well as two more tracks. 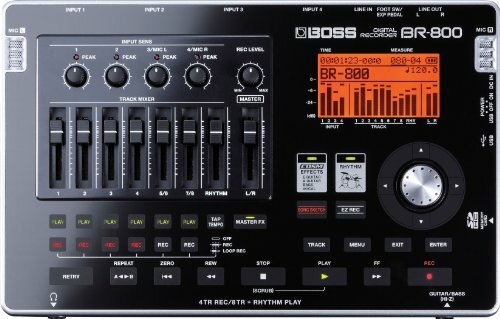 There’s also a Boss BR-800 which allows you to record 4 tracks simultaneously, which is great for bands wanting to record rough demos. 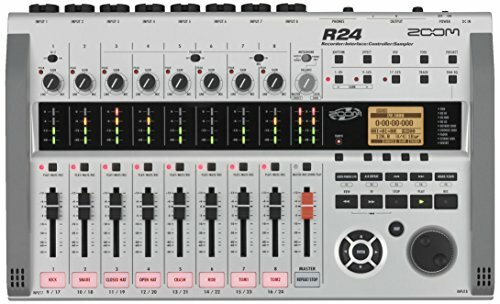 If you’re quite a tech-friendly musician, who’s already comfortable on a Mackie or similar, the Zoom R16, Zoom R24 or Tascam DP-24SD will delight you. The R16 is the most portable of these, whilst offering just 16 tracks but with the benefits of faders and Mackie emulating software. 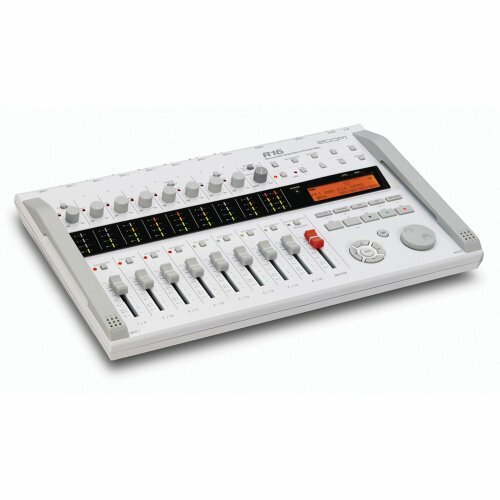 The Zoom R24 is similarly portable but with more tracks, and both of the models are designed for use with additional software (although they work alone). 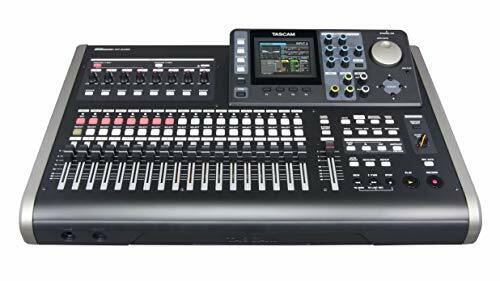 The Tascam DP-24SD is more of a studio in its own right. It’s less portable than the Zoom models, but it has a big screen and requires no computer to work at its best.